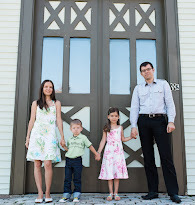 It is hard to believe Baby E is four years old and is [gasp!] transitioning to a twin size bed. When did my baby grow up?! I was kind of dreading picking out a twin mattress for her because of everything I know about them, fire retardants and how toxic they are. Not to mention that mattresses imported from China contain chlorinated tris that was banned due to cancer concerns, but is still actually present in significant amounts in these products. That's crib mattresses, I don't even want to know what's in the adult ones that don't have the same regulations. So I was thrilled and relieved to be working with Sopora, a company that makes Eco-friendly mattresses right here in the United States. We received the Sopora Ultimate Twin Mattress for review, and guess what? It arrived in this little box! I was like "What? No way a twin mattress fit in there!" I knew it was compressed, but still thought it wasn't possible! So I panicked and contacted them to make sure they did indeed send a twin size and not a crib size mattress. I couldn't open it since I would have no way to stuff it back inside. I was assured that this is the one. So we opened it and to my amazement the twin mattress popped out. The mattress took it's shape immediately and as recommended we left it to fluff up for a couple of days. We are in the middle of a remodel for the bedrooms, so all four of us are sleeping in one bedroom on our old queen mattress and Baby E on her new twin Sopora. On the occasion that Baby T takes over my side of the bed, I just scoot over to Baby E's new mattress and let me tell you, it is amazingly comfortable! So much so that I find myself over there more and more just because I prefer sleeping on it. It's a very firm, supportive surface that to me, most resembles memory foam - but maybe a little more firm. I find it really good for my not-so-good back. I am so glad she has something comfortable to sleep on and relieved that it doesn't have that 'new mattress smell'. It doesn't stink of any chemicals, and rightly so because it is made of Eco-friendly, plant based, renewable oil foam. Oh, and it does actually have two different sleeping surfaces to suit your preference, one that's more firm and one that resembles memory foam (CoolGel). I've learned over the years that not all mattresses are created equal, not just in reference to comfort, but what they are made of. As a mom of small children, sleep is a luxury for me - but I do sleep better knowing they are sleeping on a safe surface and not breathing in off-gassing chemicals for 10 to 12 hours each night. I really wish I could give each of my readers a mattress like this! But I have to say, it is a worthwhile investment in your children's health. In order of priority I would say healthy food and water are most important, but a healthy sleep environment is next on the list, in my opinion. Feel free to ask me any questions you may have about this mattress and I'll do my best to answer them! 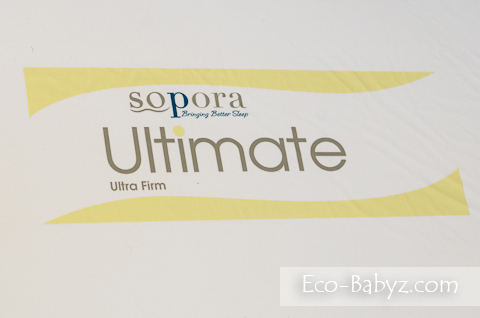 Sopora mattresses are competitively priced among the Eco-friendly, non-toxic options. The Ultimate Twin retails for $605, the Delux Twin is $439. Sopora crib mattresses are priced as low as $167 for the Classic Crib Mattress and the Perfect Crib Mattress we are giving away is $350. Sopora mattresses can be purchased directly from the company and some models are also available on Amazon. Connect with Sopora on Facebook and Twitter! 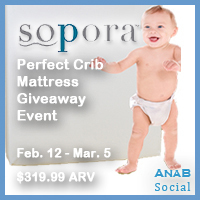 Tomorrow, 2/12/13, we are launching a GIVEAWAY for the Sopora Perfect Crib Mattress! Disclaimer: I did not receive payment for this review. I was provided a sample of the product for review purposes. The opinions are my own and genuine. May contain affiliate links that support Eco-Babyz at no extra cost to you. As much as i would love to change all of our mattresses my husband think i should live in a bubble lol to avoid all the toxins. Moving into a home we basically starting from scratch leaving so much behind when we moved. I do need a mattress and lately i've been reading about how toxic they are, i guess one at the time i would love to have toxin free mattresses. Without your blog i would never probably think twice about toxins in a mattress. no what you thinking,, im allergic to dust mites. We just bought a new crib mattresses, but I'm going to keep this in mind when we need to buy our next mattress. We just purchased a new crib mattress, but I'm going to keep this in mind for our next mattress purchase. I love that are ultrasonically welded dropped side seams, no access to inside of mattress for wetness, bed bugs, or allergens. Mattresses are expensive just to have to replace due to potty training or a spilled bottle. Even with a cover, sometimes accidents still happen. This is awesome. I used to get so frustrated reading about how toxic mattresses are but no one seemed to be doing anything about it. Finally something is being offered as an alternative. We are expecting our second and will need a new mattress. This looks awesome! Cant believe it came in that box though. I like that its stain and odor resistant. would love to have one. I only want the best of everything for my granddaughter so my fingers are crossed to win the giveaway!! 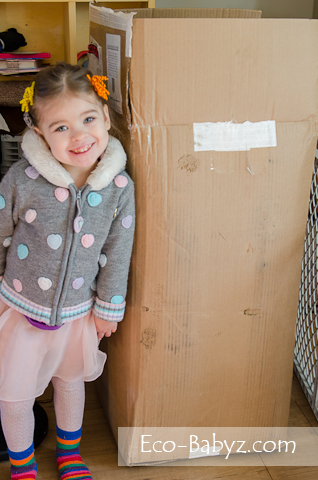 It is time for our granddaughter to be transitioned from her pack and play to something a bit bigger. My husband built a trundle bed for our second daughter when she was ready to leave the crib. It takes a crib mattress, but is closer to the floor so they don't have as far to fall. All our children have been climbers and the grandbabies have been too. We no longer have the mattress for it, so the timing for this review is perfect. I will give mh daughter the information. I wish I had the money to buy this for my daughter! But it would be nice to win the crib mattress for baby #2. Wow, I never knew there were so many bad things attached to a mattress. Mine are so old I can't even imagaine.....yuck!!!!! Thanks for the review and enlightening information about mattresses. I love that its made in the USA and has 2 sleep surfaces. It is really nice. This would be great for my son! I love the no chemicals, we are already exposed to way to many. We are using the mattress for dd#3 toddler bed but i's time to move dd#4 to the crib and we need a mattress this would be the perfect mattress! I love that they are made in the US and love, love, love that there are no chemicals in them! Definitely will be my next purchase! This mattress looks and sounds awesome! I would love for my littles to be able to sleep safely through out the night and not breathe in all those toxic gasses. I love that the Sopora products are made in the USA and are completely chemical-free! This mattress sounds fantastic. I would live to have toxin- free mattresses at our house. Would be great to win this one!! I would love to have toxin-free mattresses at my house. This one sounds fantastic would love to win it!! love the sound of this mattress! Wish they made them in queen sizes,lol! It's great to know that there is a mattress that we can buy that is Non toxic and made from renewable resources made right here in the great USA. This mattress seems great. My husband and I are pregnant with our first child and this seems like a really safe and healthy choice. 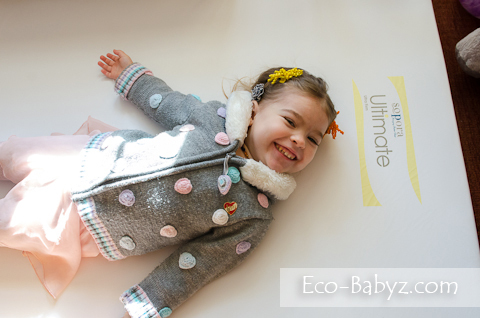 I like anything for baby without chemicals and this mattress sounds great. wonderful product!! TY for the review! Wow, thanks for introducing me to a great company and mattress. I want one for me...and the rest of the family too. I never even thought about chemicals in beds either. Great review and information. Thanks so much!! Nice review, the thought that a mattress might be harmful to my son never crossed my mind. While reading the site I learned a lot about the harmful chemicals and traditional mattresses. Very informative review and nice products. I love that you’re doing this giveaway! All the talk about SIDS being associated with chemicals in crib mattress has scared me to death, and this mattress seems like the solution. It’s pricy, but it’s probably worth it for a little more peace of mind. I love that it's antimicrobial. That's usually the winning point for me. I only recently have been exposed to the nasty stuff that is in most of the mattresses sold. These look so neat - made in the US and non-toxic. It is encouraging to see a US company that seems to care enough about the customers to not put toxic materials in its products. I've been looking for a really good safe mattress for my son. This looks really great! I'd love to get a safe mattress for my son! Love this review. Definitely a product Ill be looking into in the future! Nice.. i'm looking for a new one since i'm expecting. This looks great - thanks for your review! I read this post and thought... oh no! I didn't even think about the chemicals in a crib mattress! Thanks for the info! I need a crib mattress for when my little girl moves out of our room and into a crib...I never really thought about a mattress being toxic.